The hotel offers valet parking only at $38 per day, excluding sales tax. 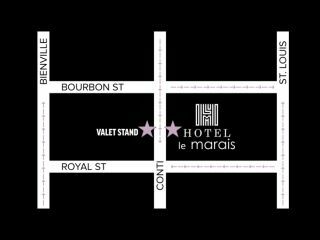 Parking rates are subject to change without notice and special valet parking rates apply during special events. During special event periods parking becomes limited due to the increase of visitors to the city. To ensure that your transportation to the hotel is as convenient as possible, we ask that you plan accordingly and call the hotel in advance for assistance and directions. Liability: The management assumes no responsibility for auto accessories or articles left in the car. No Liability is assumed by management for loss of damage by fire, theft or any other cause to, or by the vehicle while in custody of the management. The hotel does not guarantee valet parking with your room reservation and will suggest alternative parking options once the parking facility is full. Special event periods, such as Mardi Gras, New Years Eve, Sugar Bowl, Bayou Classic, Jazz Festival and Essence Festival, the New Orleans Police will have road closures.